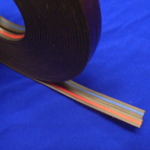 A self adhesive magnetic tape for edge - edge use. It is designed to join flush banner systems side by side. Designed to provide you with more options to create seamless images. When applied to the edges of pole mounted banner stands, you can create the look of a pop-up. Adopting the red/blue colour coding means easy application, and as the colour is situated centrally it can be applied to the banner from either the top or the bottom. To help you apply it accurately along the length of the banner the adhesive will allow you to push the strip into position before full bond strength develops.